My Christmas gift from Esther this year was a handheld GPS unit that I can use while hiking, running, cycling, boating and driving. I have been experimenting with it in many venues this past month, but finally had the chance to bring it on the water. The Garmin Oregon 400c comes preloaded with a coastal navigation map, meaning that it has detailed info and maps for all salt water locations in North America. I took advantage of a sunny afternoon and jumped in the canoe. The device works like a charm. It was interesting to watch my speed over ground fluctuate as I paddled against or with the current. It is something that you can sense by watching the water and surrounding landforms, but becomes painfully or pleasurably obvious with a GPS. 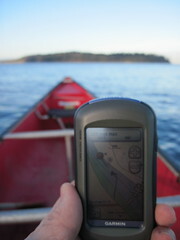 One of the very nice features of this Garmin unit is that I can sync it with my computer and have detailed analysis and maps of the route which can be stored and catalogued. Speaking of 'electronic toys,' this week is the announcement of Apple's long awaited 'iSlate' Will it have the same success as the iPod and iPhone?